Although many medical remedies exist to treat the symptoms of eczema many sufferers prefer to take a natural approach to the care of their skin. Using natural remedies to help clear eczema will result in less harm to the skin, fewer side effects, and a feeling of greater control over your skin disorder. However, before you turn to natural remedies you need to research your treatment options and clearly understand their uses. There are a few herbs or essential oils that have shown the potential to be very effective at clearing up or relieving the symptoms of eczema. The first oil, peppermint, is especially effective at relieving the itching that accompanies this skin disorder. To get the most relief simply rub a drop of diluted peppermint oil over the affected area. Another great essential oil that you can try is patchouli. This oil works as an antiseptic and effectively controls eczema outbreaks when applied topically. Perhaps the most known eczema helping oil, tea tree oil is very popular due to its ability to clear up eczema patches, relieve the accompanying itch, and reduce the redness and swelling that results from an outbreak. This oil can be applied topically to the skin, or it can be used as a cleanser, lotion, or cream when purchased as the active ingredient in these items. To help relieve the constant itching, reduce some of the redness, and help soften the dry skin of eczema taking a bath with oatmeal can be quite effective. To keep the mess down simply tie a handful of natural oatmeal into a piece of cheesecloth and let it circulate in the warm bath water. For the best results, make sure that you do not use any soaps or cleansers while soaking in the oatmeal water. 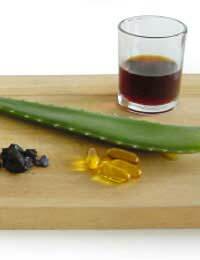 After your oatmeal bath you can then apply Aloe Vera gel to the affected area for even greater symptom relief. Just as herbs can offer natural relief for your eczema, so can certain nutrients found in nature. The most popular natural supplement remedy involves the ingestion of omega 3 oils. These essential fatty acids help the body fight inflammation. And, since eczema is a skin inflammation disorder, this oil can really help improve your condition. The easiest way to add omega 3 fatty acids to your diet is through the use of flaxseed oil. Flaxseed oil is easy to find and available at most grocery and health stores. Since the oil does have a rather unpleasant taste when used alone it is best to mix the oil with food before ingesting. Flaxseed oil mixes well with sauces, beverages, and dressings. A more obscure, but just as effective, natural supplement that is regularly used to clear eczema is marine phytoplankton. This raw material supplement can be found at most health food stores and is high in the vitamins and minerals that help new cell growth and function. Since eczema can be caused by a skin disorder that results in abnormal skin cell growth and turnover, maintaining good skin cell health is very important. This supplement can promote cell health and improve overall system health. Although all of the natural remedies for eczema discussed here are usually quite effective at controlling the disorder, there are additional benefits to their use. Using natural remedies is similar to eating nature foods. While you can give your body all the vitamins and minerals it needs by taking a daily supplement, it is proven that it is best to get those nutrients by ingesting fruits, vegetables, and other healthy foods. The same holds true for these natural remedies. Many of the symptoms can be controlled with medication but if you can get the same results with natural treatments they are going to be better for your skin and your body. Plus, every one of the listed remedies can bring about improvements to your health in addition to eczema control. By following a natural regime that is good for your eczema you will also be following a natural regime that is good for your overall health. If you use the information you learn from these natural remedies and apply it to other aliments you can eventually learn to treat your body holistically and enjoy improved overall health. @maria - infections are categorised as bacterial, fungal, viral or parasitic infections. Tee-tree oil can be a good cure-all because it is antiseptic and antifungal. Rubbing garlic and/or onion juices, over the infected part may work for bacterial infections. Vegetable compresses of cabbage leaves, mashed garlic, raw onion and other such vegetables may help. Tumeric helps fight skin infections and reduces inflammation, as it possesses anti-inflammatory properties. It has also been used for thousands of years to treat various skin diseases and heal wounds.Turmeric is available as an ingredient in ointments, capsules, tinctures and fluid extracts. Yogurt and apple cider vinegar are some of the most popular cures for fungal skin infections. Simply apply either of these on the infected area as a natural cure. Your diet should include nutritious foods containing a variety of essential vitamins and minerals. Organic foods rich in vitamin A, vitamin C, vitamin E and zinc are highly recommended. Plus eating garlic, onion and yogurt will help fight off infections internally. Drink about eight to ten glasses of water per day at regular intervals. Avoid non nutritious and fatty processed and packaged foods where you can. You'll always find a cure via nature. I hope this helps. I developed eczema on my right breast and both of my hands. I was told it was ringworm on my breast and then it supposedly became a bacterial infection and the prescription medicine called Keflex gave me the hand eczema. I got an injection of prednisone and prescription of the steroid and yet I still have all 3. Plus I have a rash of small blots that look like bites on my back,legs,stomach and underarms. I have no use for medical people anymore. Does anybody know of natural remedies? The only thing is,there are certain things I can't use because I take Tegretol because I have had seizures in the past. Thanks. In the article it states that to use peppermint oil it should be diluted before use. My question is how do you dilute it ? With oil presumably- if so what oil ?